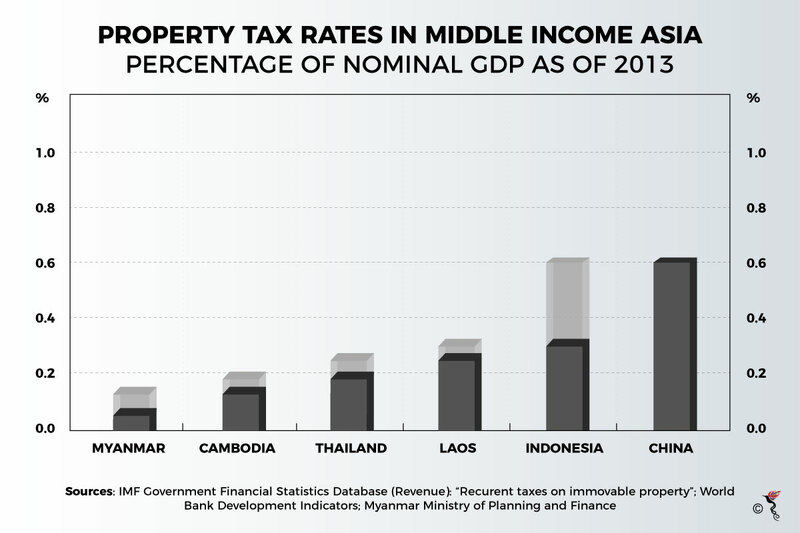 Myanmar has notoriously low residential property taxes rates, accounting for just 7.5% of GDP, compared to the 13-14% its neighbours, Laos and Cambodia pay. In 2016, this amounted to just US$1.86 per capita in Yangon according to research done by the Renaissance Institute. According to the report entitled Managing the Challenges of Rapid Urbanisation, collections were even lower in smaller cities, falling to as low as US$0.16 per capita per annum. This has proven to be an area ripe for reform especially as Myanmar looks to more revenue sources to fund its currently under developed infrastructure. Myanmar’s residential property tax structure is currently divided into separate collections of urban property tax, rural land taxes, capital gains tax, and stamp duties. Urban property taxes are levied at the municipal level and refer to taxes collected from an owner or an occupier of a property based on a percentage of its real estate value. The rates differ between cities and also tend to include payments for municipal services like water, electricity and garbage disposal. Reforms could include adjusting the urban property tax structure to a level suitable to each individual township in each city. Systems for making property valuations also need to be reassessed, so that they do not result in static valuations over time. Valuations which best reflect the developmental stage each city is at is fair while also providing steady growth of revenue base. Meanwhile, there also needs to be compliance with any reformed tax structure. Currently, there is a lack of consistency in administrative records leading to difficulty in enforcing tax payment defaults. This is due largely to a reliance on paper records, which makes it easy for mistakes and mismanagement to occur. In this regard, digitising the landscape could help, for instance, through the development of apps. This is workable since currently, municipal authorities have the authority to pilot new innovations. In a pioneer effort by Taungyii city in Myanmar, a tax app known as Myankhon has already managed to reduce the time spent stamping 25,000 tax forms from six months biannually to just two months. The app can be used by municipal staff to manage tax records digitally, and allows them to input and assess tax data digitally, inset electronic signatures and generate tax receipts. Inputting this system into property tax reforms could improve records-keeping, and thus compliance while helping different municipalities to work together. On a larger scale, stakeholders would also need to put their heads together to agree on wide-ranging reforms to its municipal governance structure, thus leading the way for sustainable development to take place. Myanmar reported a 7.2% GDP growth in 2017, and is forecast to grow at an average of 7.3% each year till 2021. This growth, however, is only likely to materialise with heavy investments into infrastructure, starting with reforms from within. The reform to its tax structure would bring it on par with cities in the rest of the world, who also rely on property taxes to fund development because of the steady stream of income they provide, and the fact that they are an equitable source of revenue because of the direct benefits urban residents receive in the form of urban services. Myanmar’ has a long way to go because its infrastructure is currently severely underdeveloped, according to a 2017 report by The Economist. The report analysed Myanmar’s infrastructure landscape taking into account its power, transportation and telecommunications grids. At the moment, electricity generation in Myanmar is capped at 5GW, because of limited electricity grid networks while only 20% of its roads are paved. Development in transport infrastructure alone would require between US$45-60 billion over the next 15 years, according to the Asian Development Bank. Poor infrastructure is just one of the challenges for foreign investors seeking opportunities there, requiring them to do extensive market research and conduct comprehensive due diligence should they want to pursue such opportunities. These, at least, were some of the measures recommended by The Economist in its Building Myanmar: Building the Infrastructure Gap, report.